Note: this website is a living document. Projects will be added once the associated repos are complete (or near complete). For projects in development, consult our Github organization and the lead author's profile. You can watch our progress on the website from this repo. For code developed by Zipkin lab members for outside collaborations, contact that study's lead author. Population data are often collected by different sources, in different locations, or on different life stages. We are developing and applying novel techniques for integrating multiple data types to estimate the distribution, abundance, and dynamics of populations and predict future trajectories. Abstract - We develop an integrated population model to address dataset discrepancies that stem from spatiotemporal variability. 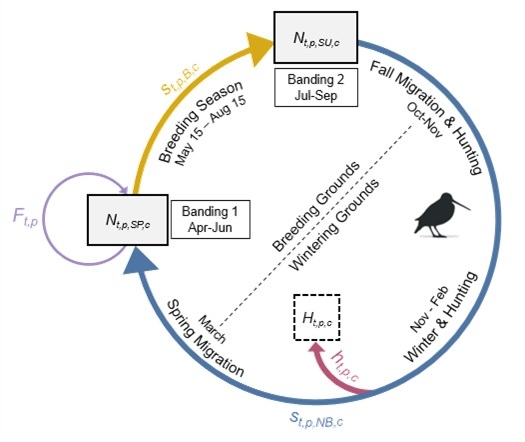 As a case study, we present an analysis of a migratory species, the American woodcock, in which individual monitoring programs suggest differing population trends. 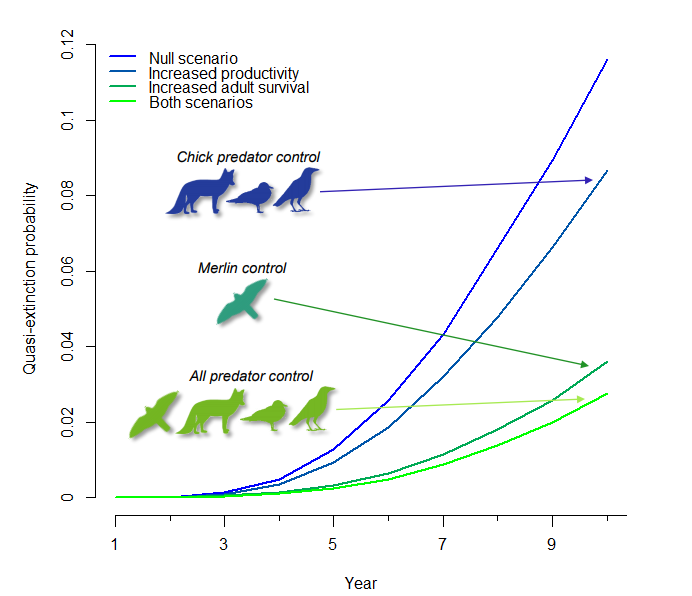 To address this discrepancy, we synthesized several long-term datasets within an integrated modeling framework to estimate population trends, and link dynamic drivers across the full annual cycle and geographic extent of the species. Abstract - We developed a coupled integrated population model-Bayesian population viability analysis (IPM-BPVA) to assess the (i) impact of demographic rates (survival, fecundity, immigration) on past population dynamics; (ii) population viability 10 years into the future; and (iii) efficacy of possible management strategies for the federally endangered Great Lakes piping plover population. Abstract - We present a modeling framework for integrating detection–nondetection and count data to estimate population dynamics and abundance. We develop a series of simulations illustrating the relative value of count vs. detection–nondetection data. We also provide an empirical example of the model combining long-term detection–nondetection data with newly collected count data from a population of barred owls in the Pacific Northwest to examine the factors influencing population abundance over time. We develop models to estimate the abundance, distribution, and demographic rates of populations using unmarked data, or data types that do not track individuals. These efforts allow us to quantitatively evaluate important life history parameters with less sampling effort than is traditionally required with mark-recapture studies. 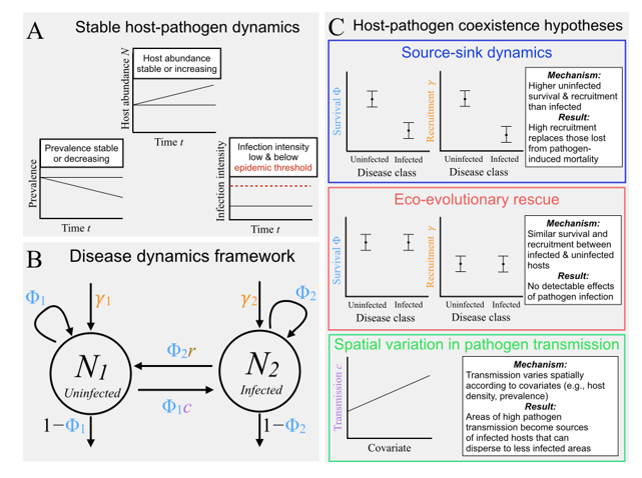 Abstract - We review the challenges of modeling disease dynamics and describe how (disease-structured) N-mixture models can be used to estimate common metrics, including pathogen prevalence, transmission, and recovery rates while accounting for imperfect host and pathogen detection. We also offer a perspective on future research directions at the intersection of quantitative and disease ecology, including the estimation of false positives in pathogen presence, spatially-explicit disease-structured N-mixture models, and the integration of other data types with count data to inform disease dynamics. Abstract - Using a novel disease-structured N-mixture model, we evaluate empirical support for three host-pathogen coexistence hypotheses (source-sink, eco-evolutionary rescue, and spatial variation in pathogen transmission) in a Neotropical amphibian community decimated by Batrachochytrium dendrobatidis (i.e. chydrid fungus) six years earlier. 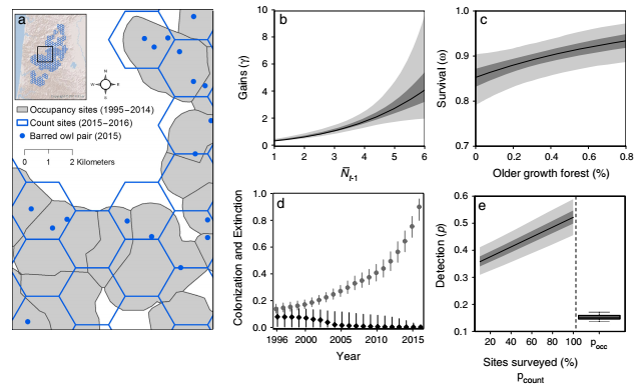 We found that the primary driver of host-pathogen coexistence was eco-evolutionary rescue, as evidenced by the similar amphibian survival and recruitment rates between infected and uninfected hosts. 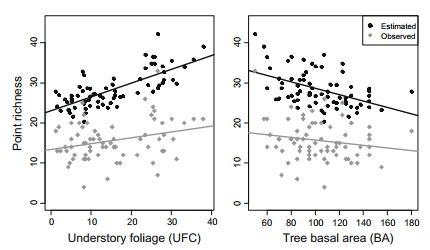 Abstract - We modeled site-specific summer abundance of monarch butterflies at sites across Illinois to assess relative associations of monarch abundance with climate and land use variables during the winter, spring, and summer stages of their annual cycle. We estimate abundance as a function of local climate, site-specific crop cover, and county-level herbicide application as well as cross-seasonal covariates, including annual abundance of wintering monarchs in Mexico and climate conditions during spring migration and breeding in Texas. Abstract - We introduce a new model (“Dynamic N-occupancy model”) capable of providing accurate estimates of local abundance, population gains, and survival probabilities while accounting for imperfect detection using only detection-nondetection data. We examine the data requirements, including the number of years and survey sites needed, for unbiased and precise estimation of parameters. 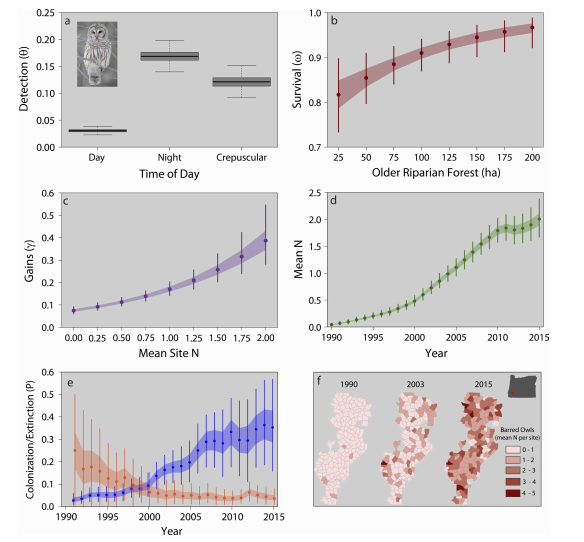 We apply our model to estimate spatio-temporal heterogeneity in abundances of barred owls within a recently invaded region in Oregon. 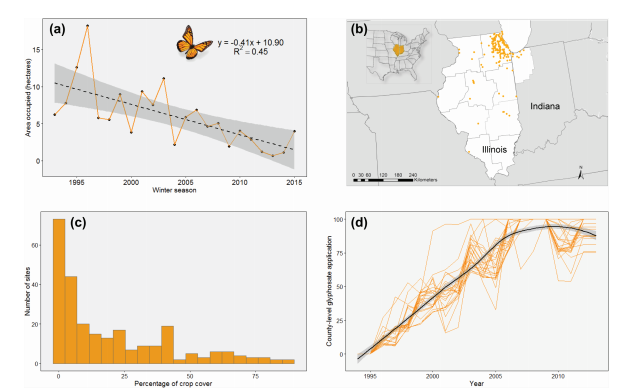 Abstract - Using negative binomial regression models and relevant local and regional scale covariates, we evaluate spatiotemporal synchrony between monarch butterflies in the two states (OH and IL). We also develop a novel quantitative assessment approach to determine the temporal predictive strength of our model with Bayesian P-values. Abstract - We extend N-mixture models to demonstrate how demographic parameters and abundance can be estimated for structured populations using only stage-structured count data. We present a range of simulations to illustrate the data requirements, including the number of years and locations necessary for accurate and precise parameter estimates. 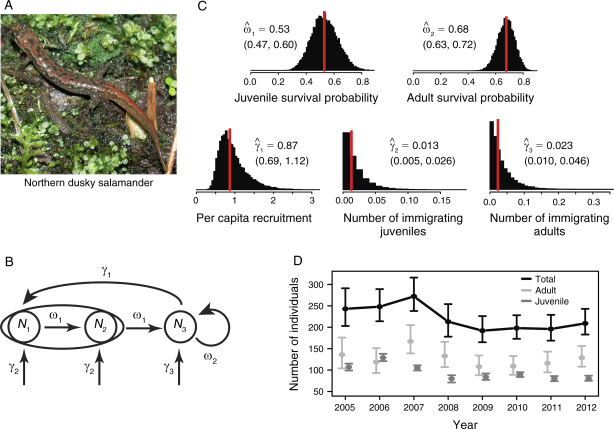 We apply our modeling framework to a population of northern dusky salamanders in the mid-Atlantic region and find that the population is unexpectedly declining. Abstract - We extend recently developed multistate, open population N-mixture model to account for the case where not all individuals can be assigned to a state during sampling. Using only state-specific count data, we show how our model can be used to estimate local population abundance, as well as density-dependent recruitment rates and state-specific survival in a black-throated blue warbler population and compare our results to those estimated with capture–recapture data. Assessing the impacts of climate and habitat on communities of species is increasingly important as abiotic conditions continue to change. Yet, most data collection techniques do not produce enough data for analyses on a majority of species observed during sampling. 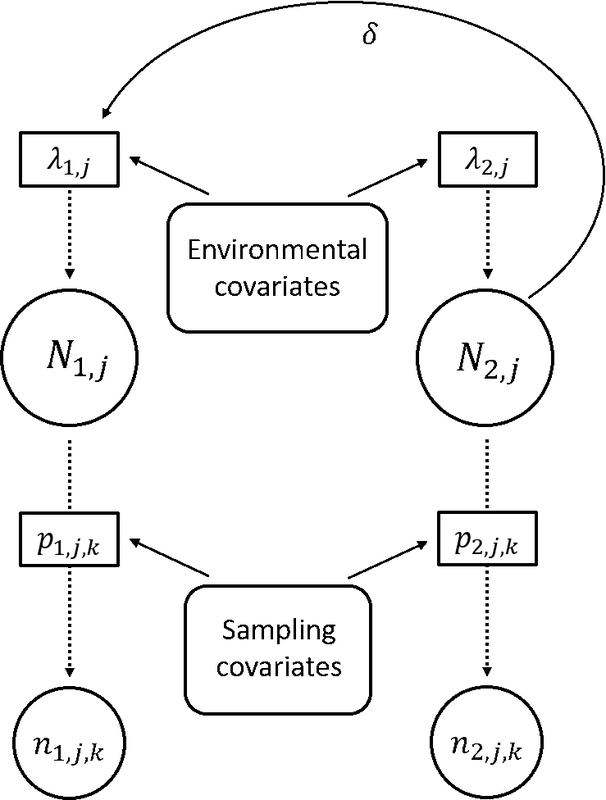 We develop multi-species models to estimate the effects of environmental covariates on all species within a community, including those that are rare or elusive. Abstract - Using a hierarchical multi-species modeling approach, we examined the effects of alternative management strategies (active vs. passive enforcement of regulations) on carnivore abundances and group sizes at both species and community levels in the Masai Mara National Reserve, Kenya. 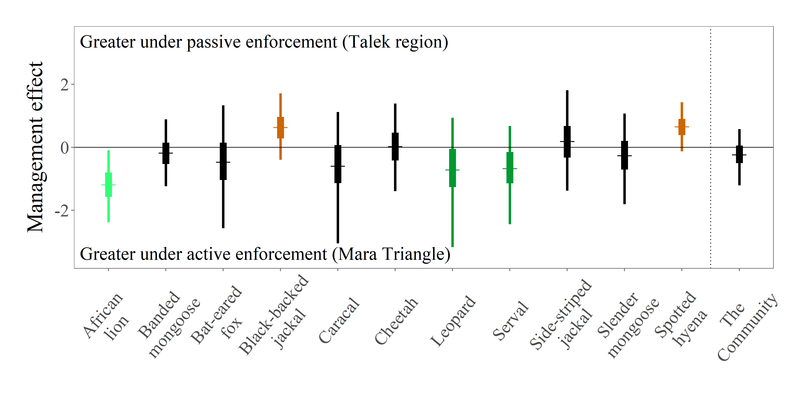 We estimated the effects of management regime on abundance and group size for 11 observed carnivore species at both species and community levels. Abstract - We quantify the response of amphibian species to landscape-scale characteristics in streams within the Brazilian Atlantic Forest. 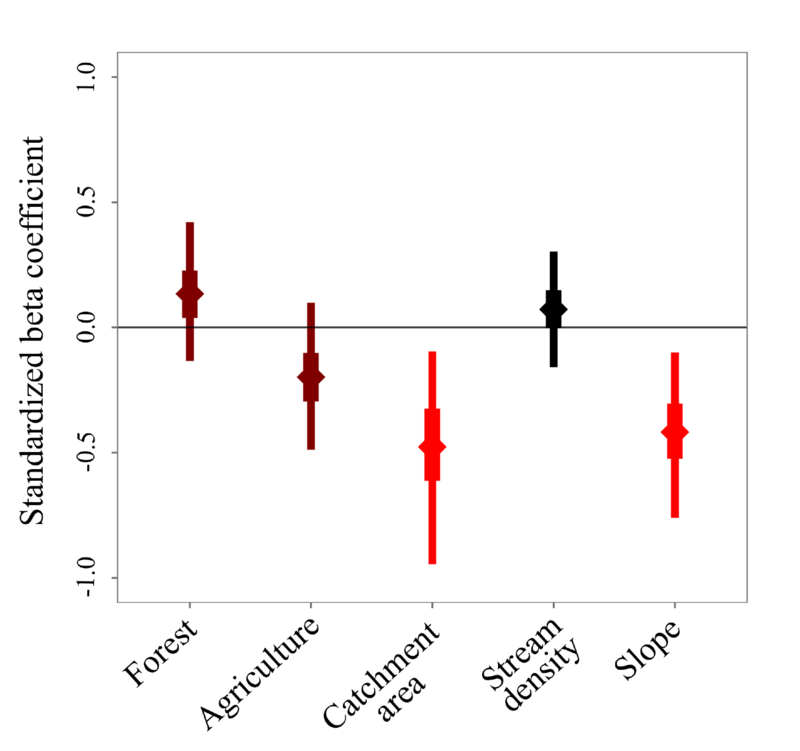 We developed a hierarchical community occupancy model to quantify the influence of landscape-scale characteristics (forest cover, agriculture, catchment area, stream density and slope) on amphibian occurrence while accounting for imperfect detection using two survey methods (an active and a passive approach). Our findings suggest that small streams and flat topography lead to higher amphibian occurrence probabilities for many species. Abstract - We developed a modeling framework to assess how the local abundance of one species influences the local abundance of a potential competitor while explicitly accounting for differential responses to environmental conditions. Our models also incorporate imperfect detection as well as abundance estimation error for both species. We applied the model to four pairs of mammal species in Borneo (civet, macaque, muntjac deer, and porcupine), surveyed by extensive and spatially widespread camera trapping. Abstract - The hierarchical community model is a multi-species approach to obtain community information, such as species or assemblage richness, by estimating individual species occurrence and detection probabilities. We provide example code and data based off of Zipkin et al. 2010 (Biological Conservation) to demonstrate how to implement multi-species hierarchical models with and without covariates. This section includes analyses and models that fall outside the subject range of the other headers. Citation - Sussman A.L., Gardner B., Adams E.M., Salas L., Kenow K.P., Luukkonen D.R., Monfils M.J., Mueller W.P., Williams K.A., Leduc-Lapierre M., and Zipkin E.F. (2019) A comparative analysis of common methods to identify waterbird hotspots. Methods in Ecology and Evolution. Abstract - Identification of biodiversity "hotspots" is subjective and various methods can lead to different conclusions. 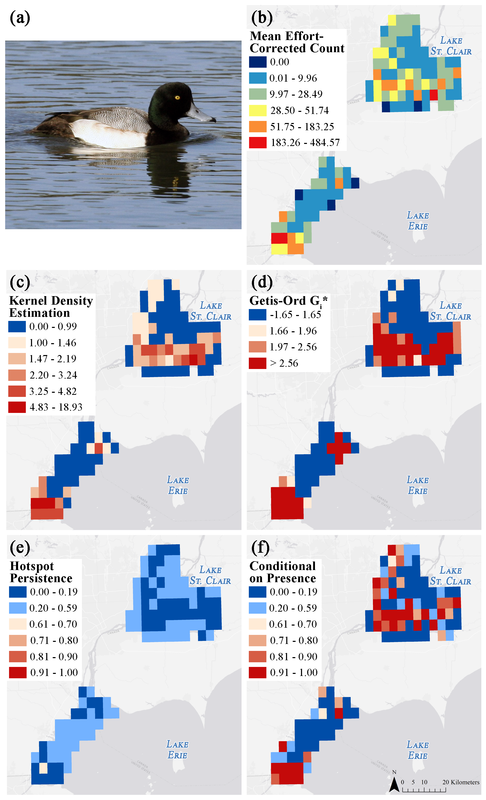 We present the results of a comparative analysis of recent approaches (kernel density estimation, Getis-Ord Gi*, hotspot persistence, and hotspots conditional on presence) for identifying waterbird hotspots. We applied each of the methods to aerial-survey waterbird count data collected in the Great Lakes. Our results indicate that formal hotspot analysis frameworks do not always lead to the same conclusions. Abstract - We present an approach to extend the two dimensional ellipse niche model into three dimensions to estimate significant features of a population's isotopic niche space including: 1) niche volume, 2) relative centroid location, 3) shape, 4) area of overlap between multiple ellipsoids and 5) distance between centroids. 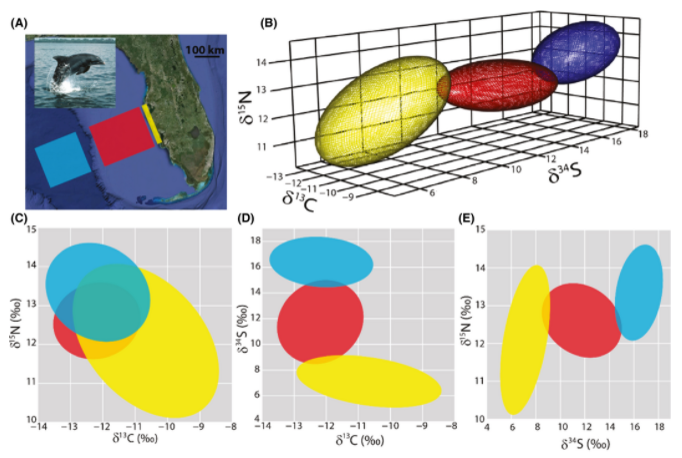 We conducted a simulation study showing the accuracy and precision of three dimensional niche models across a range of values and apply the approach to three bottlenose dolphin populations. We develop modules to share our research (and love of science!) with the public. The objective of our outreach activities are to enhance awareness of our research findings and demonstrate the value of statistics, mathematics, and coding in ecology through interactive activities. With this activity, participants will learn about monarch butterfly biology and how math models can help understand the many threats to their population. Students can examine how the monarch population may increase or decrease through a hands-on modeling experience, which allows users to adjust the amount of plant resources on the landscape, climate conditions, and other environmental variables. Watch the model results appear on your computer screen! This activity was created strictly for educational purposes. It is NOT meant to make real-world predictions nor should it be used to inform management. Monarch data (1994-2016) were taken from the annual winter colony counts, collected by the World Wildlife Fund - Mexico. Although we endeavor to make all our supporting materials publicly available, some of our analyses rely on proprietary data created by others. In these cases, please contact us or the original data creator to gain access to these data. All of the materials made available here are freely usable, with attribution. If you like our work or are building on something we've done, please let us know! You can submit corrections as an issue or a pull request to this repo. This wepage design was developed by Mozilla staff for the Working Open Workshop series and adapted by Christie Bahlai. It is maintained by members of the Zipkin Lab.